Recreations of Columbus’ Nina and Pinta will be visiting Gallipolis. GALLIPOLIS — In 1492, Columbus sailed the ocean blue and in 2018, local residents will get to experience a piece of that adventure. 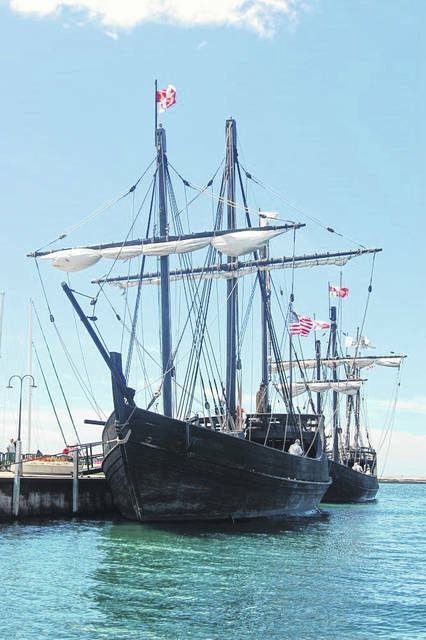 The Nina and Pinta replicas are returning to Gallipolis, after 10 years. The Gallia County Convention and Visitors Bureau announced the boats will be docked in town along the Gallipolis riverfront public use area near Gallipolis City Park, Nov. 2-7. The boats will be open for tours from 9 a.m. to 6 p.m. each day. Self-guided tours will be available along with group tour rates. During the tour, guests will be whisked back in time, surrounded by the design and materials of the historic caravel. Being a floating museum, there are also exhibits on each ship highlighting the history of the Age of Discovery, navigation of the era, how the ships were built and a taste of what life was like over 500 years ago. The Nina is a replica of the ship on which Columbus sailed across the Atlantic on his three voyages of discovery to the new world beginning in 1492. The Pinta is a larger version of the archetypal caravel and offers large deck space for walk-aboard tours. The Nina was built completely by hand and without the use of power tools. Archaeology magazine called the ship “the most historically correct Columbus replica ever built.” In 2005, the Pinta, also a caravel, was launched in Brazil and was the first ship to sight land in the New World. Historians consider the caravel the Space Shuttle of the fifteenth century. Both ships tour together as a new and enhanced “sailing museum” for the purpose of educating the public and school children on the “caravel,” a Portuguese ship used by Columbus and many early explorers to discover the world. Before him, the Old World and the New remained separate and distinct continents and ever since their fates have been bound together for better or for worse. Admission rates as reported by the tourism bureau website are as follows: Adults $8.50, Seniors (60 years +) $7.50, Children (ages 5-16) $5, Children 4 year and younger, free admission. Group rates: Groups of 15 or more will have an admission of $5. Groups will need to contact the Gallia County Convention and Visitors Bureau at info@visitgallia.com, 1-800-765-6482 or 740-446-6882. The bureau will compile group information for the Columbus Foundation to schedule. For more information, http://www.thenina.com/; for accommodations, restaurants and other attractions go to visitgallia.com. The ships arrive on Thursday, Nov. 1.